I don't consider myself much of an artist. Perhaps it was the effect of going to a high school with many talented artists, but I suppressed the urge to create with my hands, because I was surrounded by people who did it so much better than I did. When I started experimenting with recipes in my tiny studio apartment in France, it was because I was away from easy access to cafeterias and convenience foods for the first time in my life. Reading recipes, or watching bootlegged cooking shows on the Internet, and then reinterpreting those recipes soon became more than a way to feed myself. It was a hands-on artistic endeavour, the type which I had blocked myself from doing, convinced that I wasn't good at it. 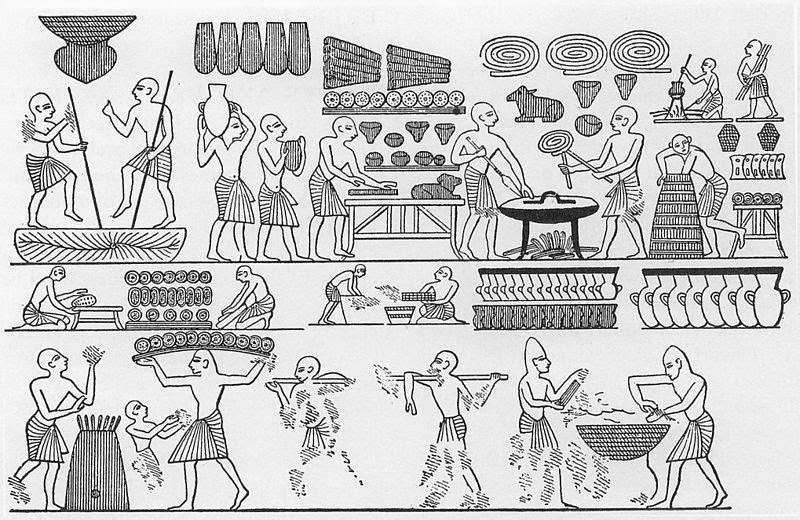 Cooking, for me, has been a way to explore the creative process in a way that, unlike my drawing, pottery, or sewing skills, drew real appreciation from others. Presenting that food to look nice, however, isn't often a priority for me. I still don't feel very confident in my visual art skills -- I often apologize for how my food looks, and make excuses for my shrunken, commute-beaten, workaday dishes. "After all," I tell myself, "people didn't care so much about how their food looked before the days of food blogs and Instagram." Well, sort of. It's true that no one in the 18th century would have hired a food stylist; but how many still lifes of fruits, fowl and fish line the halls of the world's art museums? The aesthetics of food have been important in art for centuries, and Salvador Dali's Les Dîners de Gala is a continuation of the tradition of using food as part of art. 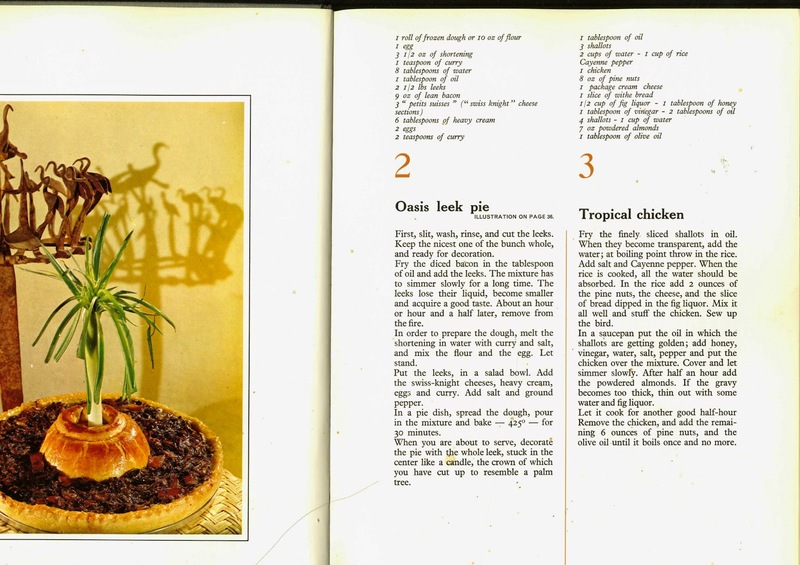 When the book was published in 1973, however, the prevalence of colour photography, television and advertising would have meant that people were confronted with idealized, styled food much more often than their ancestors were. While Dali's cookbook is not necessarily designed for the home cook, the attention to composition and detail in the photography for the book is a harbinger of the importance food styling would have in the 1980s and after. Martha Stewart, whose name is synonymous with meticulously prepared meals that are beautiful to look at, published her first book, Entertaining, in 1982 and within a decade there were magazines devoted just to food, the precursors of the cooking channels, and food blogs which would come into vogue. Nowadays, food presentation has become an obsession. Instagram, Pinterest, Facebook and Twitter allow us to share not only pictures of what we ourselves are cooking and eating, but of the meticulously decorated cakes and tablescapes of people we have never met. It's easy to feel inadequate when you're recreating a Martha Stewart recipe; it's even easier to feel bad about your own food presentation skills when you're comparing your latest efforts to Pinterest pictures from strangers who manage to make their dishes look beautiful without the help of food stylists. Salvador Dali's Les Dîners de Gala is a book which is all about food presentation. I would need to make something that was beautiful to look at, whether or not it was good to eat. 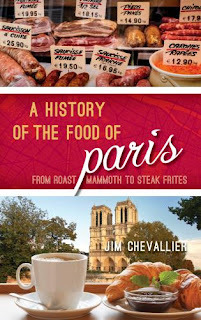 Others who have tried the recipes from this book weren't particularly impressed, so I didn't have much hope that I'd be able to cook something that I'd actually want to make again. 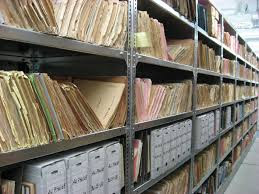 The original recipe from Les Dîners de Gala. 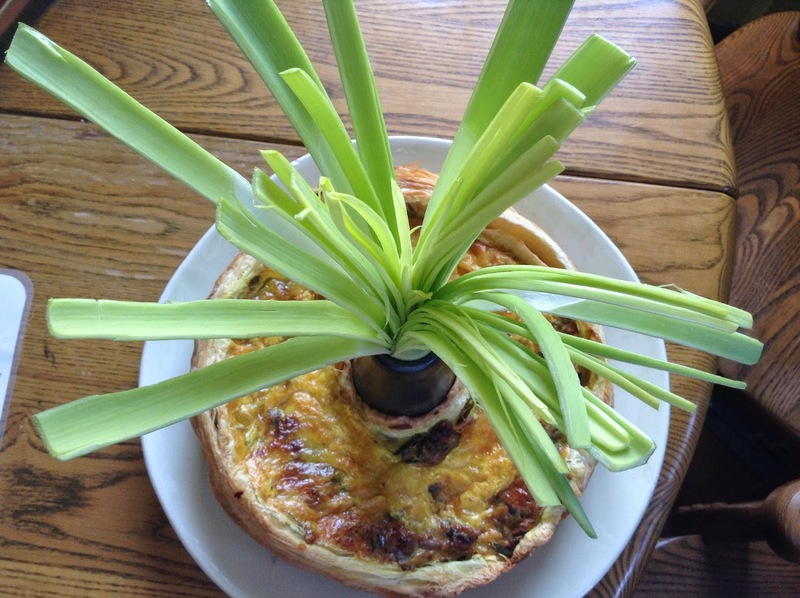 I was pleasantly surprised by the "Oasis leek pie," however. This curry-spiced quiche pleased everyone who tasted it - even my housemate's cat attacked the leftovers, a pity for my packed-lunch plans. Moreover, I couldn't believe that I'd made something that looked good, too - dare I say, even better than the picture? I was glad to have spent $12 on a tube pan last fall for a series of apple cakes; with it, I was easily able to mimic the effect depicted in Les Dîners de Gala. The peeled leek sticking out of the middle really did look like a palm tree. Inspired to put my own twist on the island scene, I took a few of my housemate's green grapes from their bag on the counter and added them to the "tree." My dinner companions and Facebook friends were thrilled with the effect - or, at least, thrilled that my food pictures looked more appealing than they normally do! Perhaps there's hope for me to improve my visual art skills, after all. These leeks aren't ready yet! While this recipe is in the section on "exotic dishes", it seems relatively tame in comparison to many of the other choices in the book. While instructions to make pastry are given, I decided that if the recipe said I could use frozen pie crust, well, then, I would use frozen pie crust. In fact, wanting to make the dish meat-free, I used frozen puff pastry, which, unlike the pie crusts in my grocer's freezer, does not contain lard. Some of the recipes in Les Dîners de Gala have unclear or missing directions, but this recipe was written in a straightforward fashion and easy to understand if you already know how to make quiche. That said, I'm planning to make another Dali recipe later in the month; if there's one you'd like me to tackle for a blog post, let me know in the comments! 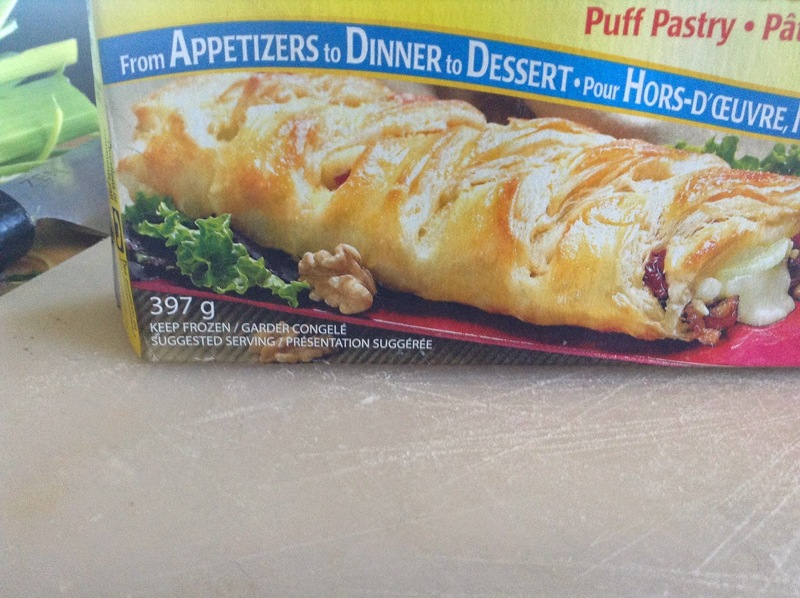 At least two hours before you start cooking, defrost the puff pastry (check the instructions on the box). When it is thawed, roll it out and press it on the inside of a tube pan. If you don't have a tube pan, press the dough into a pie plate, and conserve some to make a dome on the back of a small oven-safe bowl. The hole or dome will be the base for your "palm tree." Put your oil and butter in a pan over medium heat. Look at your leeks. Is one of them better-looking than the others? You'll need to pick one to be your "palm tree." Take the other three leeks and cut them very carefully into thin half-moons -- definitely not at such an angle that you cut through your thumb and fingernail. (Ahem). Cook the leeks in the butter and oil for at least an hour. They will decrease in volume and smell wonderful. If you're afraid they're burning, a splash of water or that white wine that's been in your fridge too long will do nicely. While the leeks are cooking, make your custard so it isn't fridge-cold when it comes time to bake the pie. 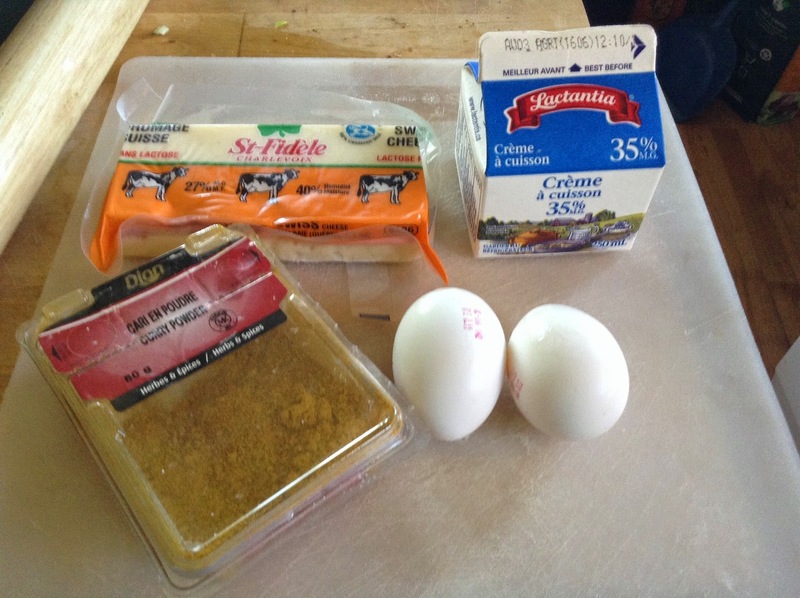 Whisk the eggs, cream, curry powder and grated cheese together. Dali's recipe calls for "Swiss Knight," which is a processed, spreadable Gruyère; if you prefer to use soft cheese like this, it would probably affect the texture of the pie. Personally, I chose a Swiss from the Charlevoix region of Quebec. You can also heat the oven to 425 degrees while you wait for the leeks to finish cooking. When the leeks have browned a bit and are tender -- breaking apart with the gentle pressure of a spatula -- pour them into the pan you have prepared with the puff pastry. Pour the custard over top and bake for 30 minutes. The pastry will be golden brown and the custard will have set. 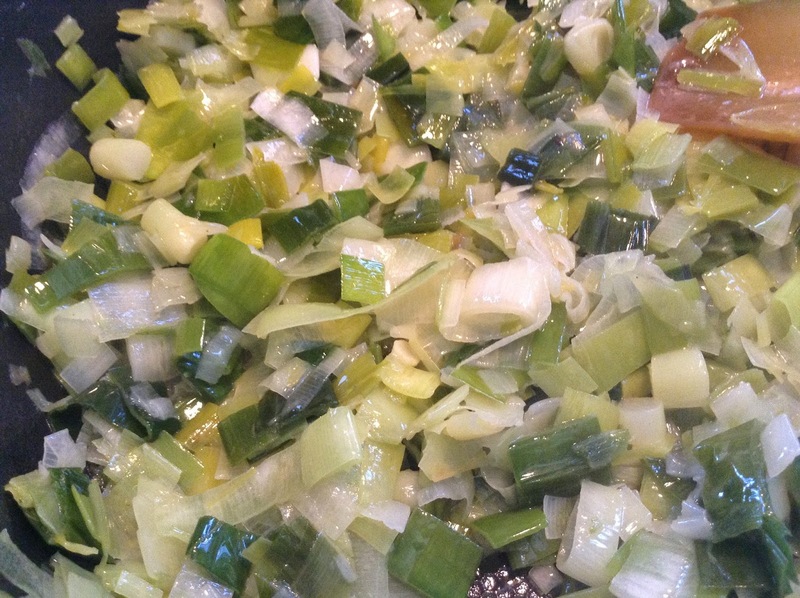 To make the "tree," make incisions in the leek and peel some of the layers down. If any are too droopy, you can give them a snip with a pair of scissors. Stick it in the middle of the tube pan to anchor it, or balance it in the middle of the dome that you made, right on top of your pie (in this case, you may need some toothpicks connecting the base of the leek with the middle of the pie to hold it in place). Poke a threaded, sterilized needle (white thread is best) through a grape and tie it to a layer of leek near the base; repeat as desired to give the effect of unripe coconuts (or ripe ones, if your grapes are red). Voilà! You have a coconut tree in the middle of your oasis. The pie can be served warm or cold, and made a nice contrast with Alex's lobster at our monthly meeting -- though I think it would go well with a variety of accompaniments, from salad to sausages! Thanks, Dianne! Let us know how it turns out! 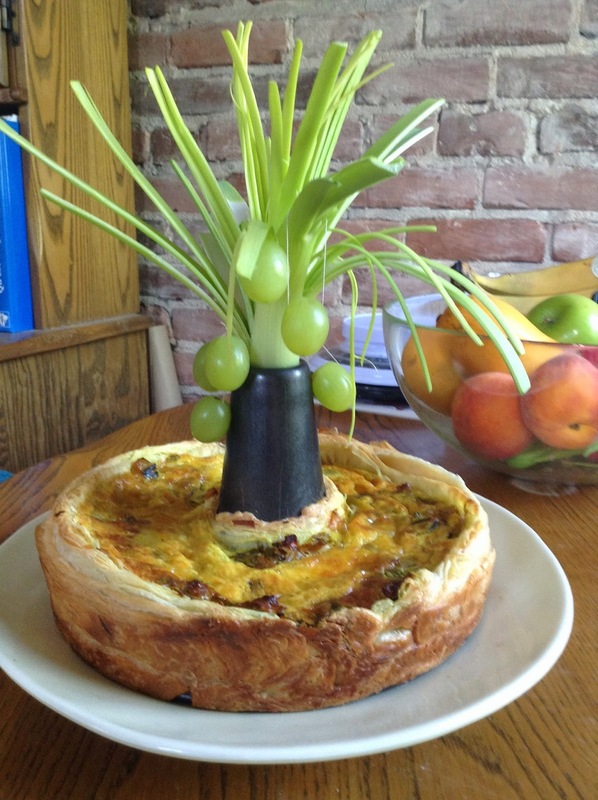 Awesome palm tree pie, Kathleen!